Luscious light blue and charming yellow gold come together for an enchanting style. Apples of Gold takes three round cut aquamarine stones and places them side-by-side for a charming look. The gemstones on the side measure 3.5mm while the slight larger center stone is 4mm. Each shimmering aquamarine stone is held tightly by four lovely yellow gold prongs. A smoothly polished yellow gold band completes this gorgeous combination, only from Apples fog Gold three stone jewelry collection. 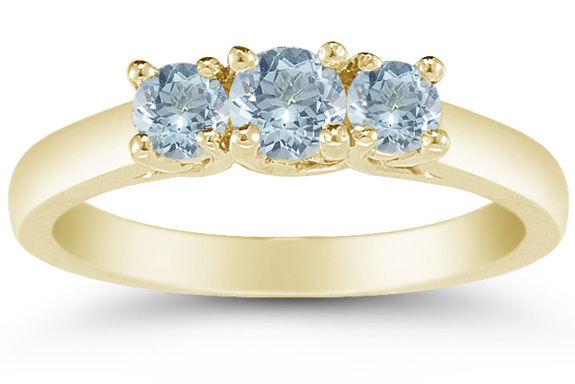 We guarantee our Three Stone Aquamarine Ring, 14K Yellow Gold to be high quality, authentic jewelry, as described above.